Reheat the bolognese sauce and beans in the pan. If your bolognese sauce is too wet, reduce it over medium heat for 10 minutes or until it has less liquid. Empty the whole bag of Doritos into the baking dish. Cover the tortilla chips with 1/2 of the grated cheese. Scatter the onion over it. Spoon over Bolognese sauce and beans. Add pieces of red pepper and olives. Distribute all ingredients evenly. Bake in the preheated oven to 200°C for 10 minutes or until the cheese is melted. Decorate with slices of avocado. This is another easy meal that goes into my leftover recipe collection. It’s very popular among children. 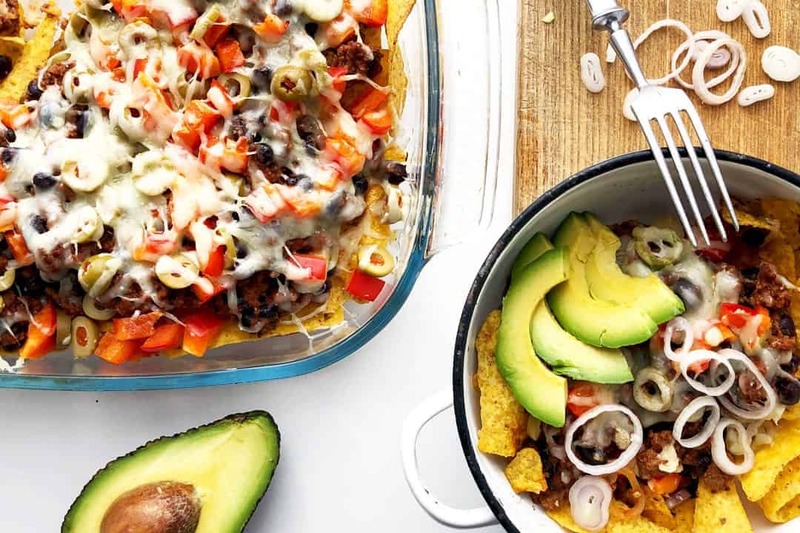 The preparation takes up to 20 minutes and then another 10 minutes in the oven so voila you can serve nachos for dinner in 30 minutes. You don’t need any exact measurements for this recipe and you can use all sorts of ingredients. Just experiment with what you have in the fridge and add as much as you like. What type of cheese is best for nachos? The best cheese is the one that melts easily. I often use cheddar cheese but grated mozzarella or red Leicester cheese are both good too. 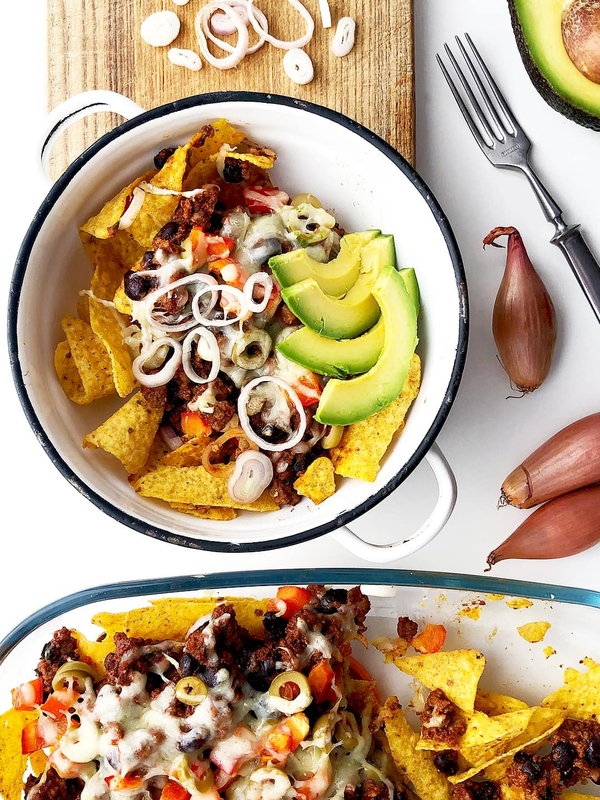 You don’t actually need anything else than cheese and tortilla chips to make quick basic nachos. Use a mix of all three kinds of cheese and make ultimate triple cheesy nachos. What are toppings for nachos? Additionally, you can serve nachos with different types of dips, guacamole or sour cream. One thing I discovered and it really tastes great with nachos is my homemade basil pesto. I just spoon a few little drops over the nachos on my plate to take this meal to another level. A great tip for quick toppings is to use leftover tomato sauce or bolognese sauce. I don’t really cook any sauces exclusively for this recipe. 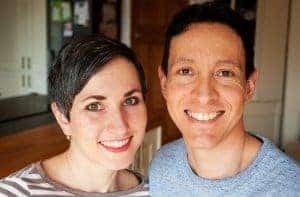 I learnt to plan our meals in advance and cook in bigger batches. I make a big pot of bolognese sauce that covers at least 2 of our dinners. Spaghetti bolognese is usually the first option. 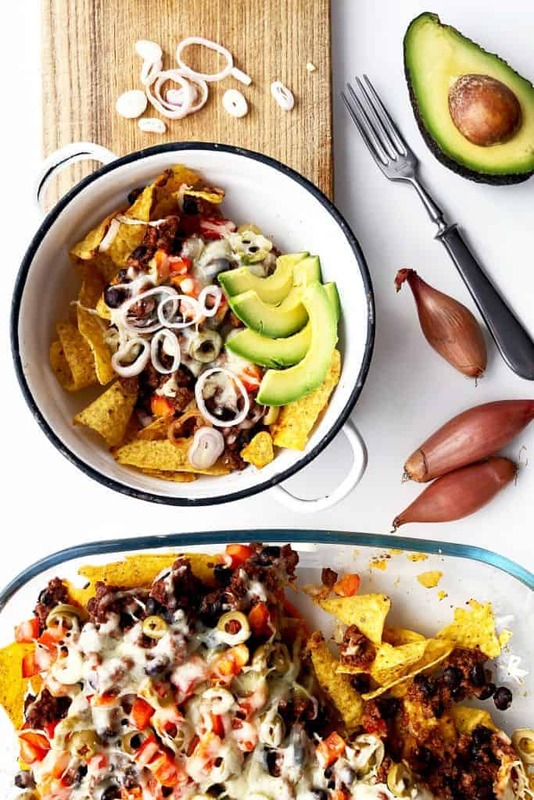 For the other half, it’s easy to convert bolognese into chilli con carne or like in this recipe to use leftovers as a topping for nachos. How do you keep nachos from getting soggy? Always cover tortilla chips with cheese first before adding other toppings. The cheese helps to protect chips from sauces and ingredients containing some liquid. But it won’t help if you use very wet ingredients. So drain the beans and olives properly before adding them in. When I want to use my leftover bolognese sauce I usually reduce the sauce in the pan over medium heat to make it dryer. 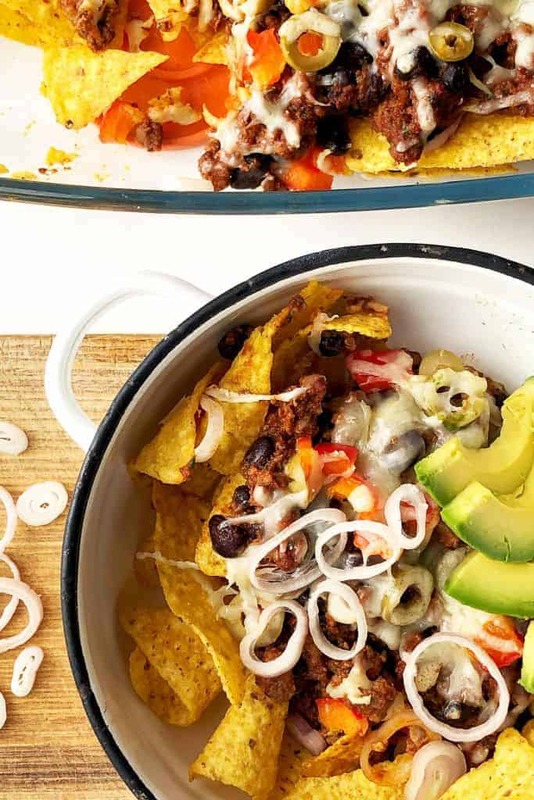 The main ingredient – tortilla chips are generally gluten-free as well as cheese and all other ingredients in this recipe. But always check information on the packaging to be sure. I like to use Doritos Cool Original Tortilla Chips. These don’t contain any gluten but be aware of cross-contamination from the factory if you are celiac. I also found out that some of the Doritos Tortilla chips flavours contain wheat – like Doritos Chilli Heatwave Tortilla Chips so choose carefully when picking ingredients for your Nachos.